This sought after model was built by Riviera in 2004. The original owner did not hold back when ticking the options list, as this is one of the highest specifications we've seen in a Riv 37. Luxuries afforded by the extensive build include 3 fridges and an ice maker, premium Riviera linen pack, game fishing chair and outriggers, high spec Raymarine E120 plotter with autopilot plus remote control in cockpit, TV in master cabin and the list goes on! Comfortably accommodate a family of 4 or two couples across the two cabins, not to mention the extra comfortable saloon settee for additional sleeping capacity. A spacious galley with 2 hob electric cooktop will easily meet your entertaining requirements, and the large saloon can be enjoyed by everyone in inclement weather. The teak laid aft cockpit is perfect for enjoying the weather and entertaining guests, also the ability to mount a game chair will keep the keen fishermen entertained. 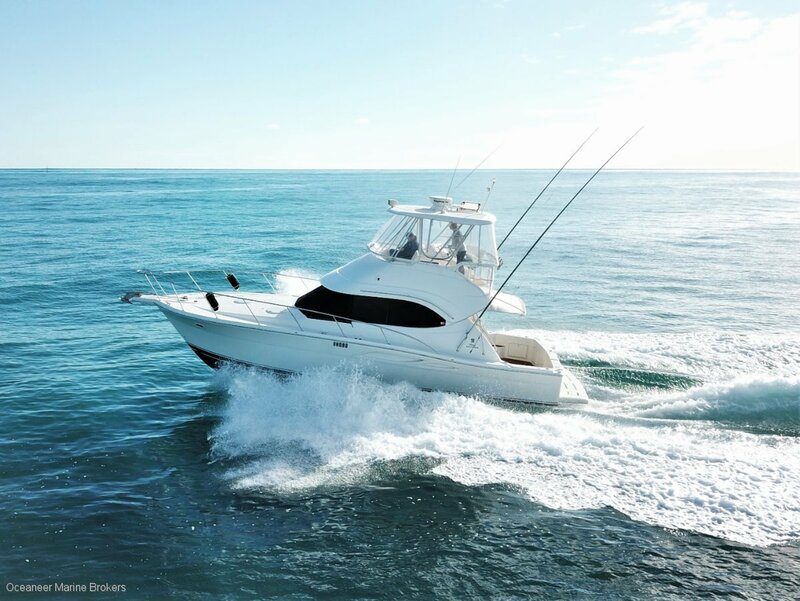 A light and roomy flybridge with seating for 6 will please the skipper and their friends, especially with easy access to frosty drinks provided by the console mounted bar fridge. Well maintained Cummins 6 cylinder 370HP diesels effortlessly push the Riviera 37 to a top speed of 28 knots and maintain an economical cruising speed of 24 knots. These engines are among the most reliable and readily serviceable on the market and will give you many trouble-free years of boating. For any enquiries or should you wish to book an inspection, please don't hesitate to send through a contact form and call one of our experienced brokers on 08 9243 6373.
electronicsRaymarine E120 echo sounder, Raymarine GPS, Raymarine E120 plotter, Raymarine autopilot. Radar, VHF/27mhz radio, Alpine head unit stereo and speakers.